What can you say about Swordfish. It's a rock em', sock em' guilty pleasure from the word go. It's got a look to it that the late Tony Scott would approve of. It's also sprinkled with some Jerry Bruckheimer star dust (these two weren't involved with the making of the film but their influence is there). So OK, let's not beat around the bush, this movie is so campy that you might have to build a fire and make some s'mores just to view it. It's got a little bit of everything for all types of movie patrons. A sort of dumbed down Matrix (1999) (I'm telling you, this is not an insult), there is plenty of action highlighted by slow mo explosions, Halle Berry showing off a little skin, Hugh Jackman playing a computer hacker (for all the technology lovers out there), John Travolta hamming it up as Gabriel, the ultimate terrorist jokester and Don Cheadle (always reliable) playing a flamboyant FBI agent. In retrospect, Swordfish is such a fast paced movie that the filmmakers don't want you to figure out how silly it is, they just want you to be entertained. Toward its over-the-top conclusion, Swordfish almost comes literally to a screeching halt. It kind of pulls the rug from underneath you. In truth, I love surprise endings and it's strange because up until the last ten minutes, I never thought this flick was the type of picture that would have that characteristic. I'm glad I was mistaken. To set the record straight, I go to the movies for two reasons, to escape from reality and be entertained. Swordfish, by hook or by crook, accomplished both. 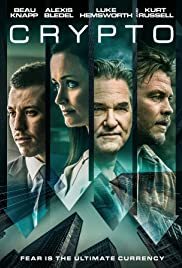 The story begins with Hugh Jackman's character (computer expert Stanley Jobson) being tapped for an illegal assignment by a renegade terrorist (Gabriel Shear, played with chilling banter by John "notice my goatee" Travolta). Jobson is considered one of the greatest hackers in the world and Shear wants him to hack into a government slush fund to steal possibly 9.5 billion dollars. Jackman's character is gonna pocket a huge cut from this job, so why not. He's trying to get custody of his loving daughter. And basically, he really needs the money to get a darn good lawyer. But hold up, Jobson is also being followed by L.A.'s finest because he's not suppose to be in California. He already went to prison for his criminal computer deeds a few years ago. This, among other saturated plot elements, sets the film running. Jackman's character is pulled in different directions and it's hard for him to concentrate on the task at hand. It certainly doesn't help when Halle Berry (undercover agent Ginger Knowles) distracts him to the point where he doesn't know who to trust. 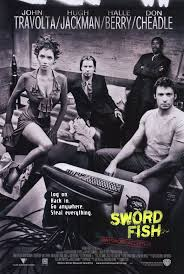 In its short running time (hour and a half plus change), Swordfish starts to reveal more and more plot twists, until the story just plain hits you over the head. The sense of urgency and immediacy that accompanies this film is downright scary. Some critics have called this movie silly and ludicrous (among other things), I say everyone is entitled to their own opinion. I liked it by cracky! I embraced the film even more as things got darker, especially with Travolta's character's motives. He actually says, "I'm a murderer oh and much worse." Throughout the film, he delivers a lot of speeches and chews more scenery than a rottweiler with a 72 ounce steak bone. The best part is that you think you know him, but the layers just keep coming (hint hint). Jackman, playing it a little more serious, gives Swordfish a heavy dramatic center. In this type of giddy, goofy movie in which stuff is blows up, it's not entirely needed, but I don't fault his efforts. This film and the X-Men movies kind of put him on the map. As with a lot of three star vehicles (including this one), their are a couple of oversights here and there. One of them might just be the screenplay by Skip Woods (screenwriter, A Good Day To Die Hard (2013)). Yeah, it's got a lot of juicy one liners that the actors can play with, but it lacks a more potent element. That would be attention to detail. Then you have the under utilization of actor Don Cheadle (agent J.T. Roberts). His character is fairly well established in the first and second act, but he gets put on the back burner toward the last 30-40 minutes. By the end, you pretty much forget that he's even in the movie. All and all, Swordfish is part bad boy cyber fantasy, part thriller, and part political drama. After viewing it, I attained this thought. Sometimes a film is so bad it's good. This one is so bad it's brilliant. It winks at the audience hoping that someone will wink back. It painstakingly begs you to like it. Don't worry guys, you've got a friend in me.